There are an infinite amount of books with unfathomable sea of words pouring out of them. We all have read many such books but there are only a few that can be related to our lives. 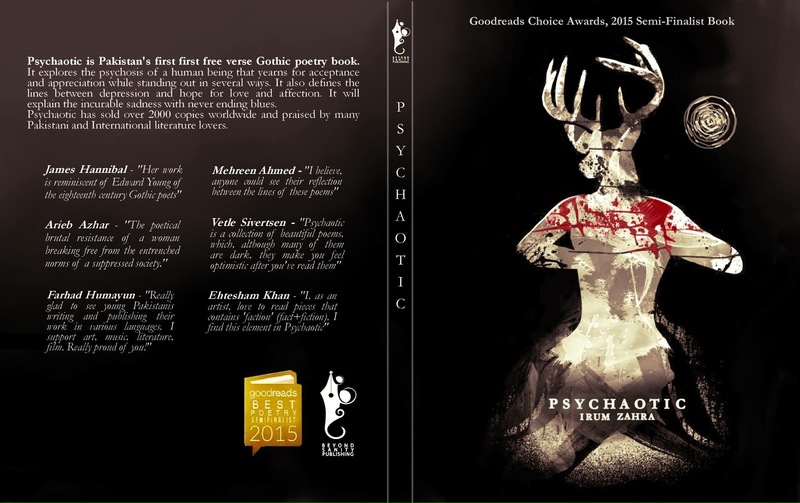 Irum Zahra’s ‘Psychaotic’ is a book related to poetry with little toppings of sweet prose. It successfully stands out to be a great collection of poetry because of the bond that this book develops with the reader and gives a serene moment of soul surfing. Not at a single moment, while reading, anyone would develop an impression that this book is written by someone else. It turns out to be a rhyming and rhythmic story of our own personal lives. Psychaotic touches our hidden passions for tragedy at first by cherishing on its aftermath. It then moves to pain, both emotional and physical. A unique taste is served here by giving both perspectives of pain; when it is inflicted on the victim and then finding the joy of sadistically throwing it back to its origin. Themes of love and its evolving stages are beautifully explained along-with a narrative on different perspectives about such themes. Psychaotic slowly engulfs the reader by providing the comfort of feeling and connecting to each word and emotion written in it. Indeed a great work by a very talented poetess and writer.